A crisp fillet of sea bream served with wilted fennel and a cherry tomato, basil and olive oil sauce. Prepare the fish by removing the pin bones and any scales. Prepare the sauce vierge: remove the skins from the cherry tomatoes by immersing in boiling water for 10 seconds and then placing them straight into iced water. Remove the skins with your fingers and the cut the tomatoes in half. Season with salt to draw out the juices. Finely dice the shallots and the garlic and mix with the tomatoes. Leave this for one hour at room temperature. To finish the sauce, shred in the basil and add the olive oil. Check the seasoning. Cook the sea bream fillets in a hot non-stick pan with olive oil. Season with salt and then place in the pan skin side down until the skin is crispy. Turn over to finish cooking and finish with a squeeze of lemon juice. 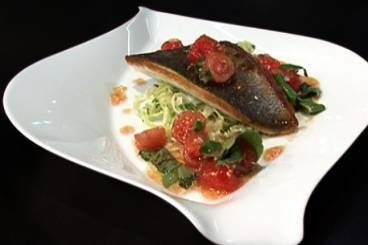 To assemble the dish: place the sea bream on top of a bed of fennel and drizzle the sauce vierge over the dish.